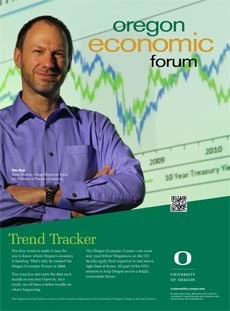 First: Don’t forget to register for this year’s Oregon Economic Forum! You won’t want to miss our exciting lineup of speakers this year! For more information, click on link below. Keynote Speaker: Heather Boushey, Executive Director and Chief Economist, Washington Center for Equitable Growth. Second: For more information on the national economic situation and the Federal Reserve, don’t forget to visit Tim Duy’s Fed Watch. Third: Below is the University of Oregon State of Oregon Economic Indicators for July 2018. Please be sure to download the full report – now expanded to include additional charts of the economic measures used to construct the UO Index! The moving average measure, which smooths out the volatility, stood at 0.98, well above average (“zero” indicates average growth over the 1990-present period). All sectors made positive contributions to the report. The unemployment rate, which fell to 3.9% in July, also made a substantial contribution to the measure. That said, the decline in the labor force growth raises concerns about the availability of workers as the expansion continues. The University of Oregon Index of Economic Indicators fell 0.4 percent in June, extending a string of declines. The primary reason for the decline was an ongoing slowing in new housing permits. While single-family home permits have held steady, multi-family permitting has declined substantially, particularly in the Portland region. A second factor in the decline of the UO Index was a reversion of employment services payrolls, primarily temporary help employees, after a steep run-up earlier this year; this appears to be just a normalization in the data. A final significant factor in the decline was falling manufacturing hours worked, but this drop is likely temporary as it stands in contrast to other manufacturing data which reveal solid activity in the sector.